The Home Energy Rating System (HERS) Index is the nationally recognized scoring system for measuring a home's energy performance. Developed by RESNET (Residential Energy Services Network) and introduced in 2006, the HERS Index is the industry standard for measuring the energy efficiency of homes. A home receives a HERS Index Score based on the results and analysis conducted by a RESNET Home Energy Rater. The HERS Index Score can be described as a sort of miles-per-gallon (MPG) sticker for houses, giving prospective buyers and homeowners an insight as to how the home ranks in terms of energy efficiency. TerraWise is a RESNET Energy Smart Builder. No other homebuilder in Jacksonville can consistently match the HERS scores of TerraWise Homes. Older existing homes will typically have a HERS score in the 130s range. Standard new homes constructed by most builders today score around 100. 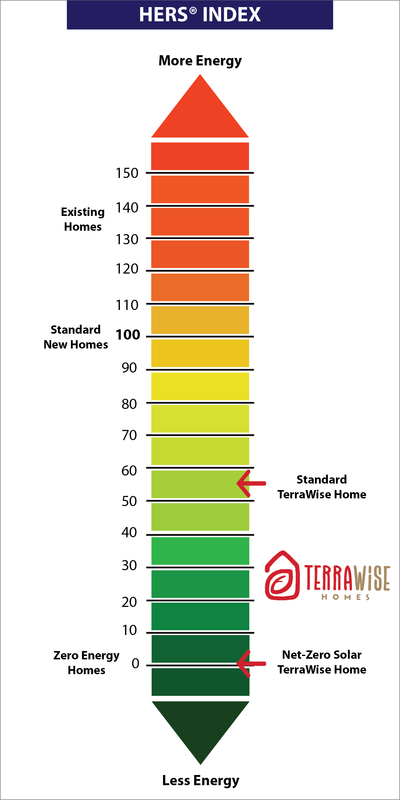 A standard TerraWise new home scores between 50 and 60. Net-Zero Energy homes, including those built by TerraWise, have a ZERO "0" HERS score. TerraWise Homes obtains and provides the customer a HERS Score for every new home it constructs. Most builders don't provide a HERS Score at all. Many that do are scores based on a model or other version of the home, which is not accurate since the location and other factors can greatly influence the score. Demand a HERS score if you are building a new home and be sure it's for the specific address to get a true rating of its energy efficiency. about the HERS Index ratings. To calculate a home's HERS Index Score, the certified RESNET Home Energy Rater compares the data of a subject home against a 'reference home' – a design modeled home of the same size and shape. The lower the number, the more energy efficient the home. The U.S. Department of Energy has determined that a typical resale home scores 130 on the HERS Index while a standard new home is rated at 100. A TerraWise Home will score below the standard new home due to higher energy efficient design and construction. Our Net-Zero Homes have a 0 score! Government agencies such as the Department of Energy (DOE), Department of Housing and Urban Development (HUD) and the Environmental Protection Agency (EPA) recognize the HERS Index as an official verification of energy performance. Benefits of having a HERS rating? Find more information about the benefits of HERS ratings on the RESNET website. Access the RESNET National Rating Registry to find information about rated homes. Contact us to learn more about TerraWise Homes HERS ratings. 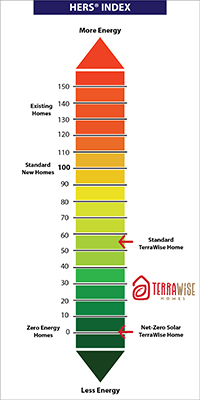 Contact us to learn more about the HERS Score and RESNET in your new TerraWise home.